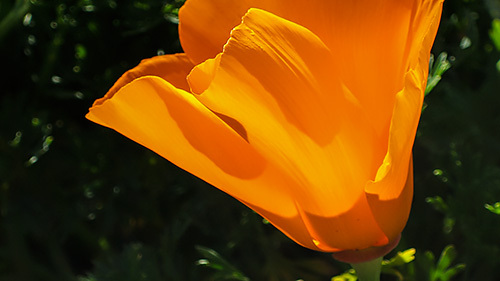 Today we remember those who died while serving in the armed forces with a California poppy we photographed 10 years ago with a Canon PowerShot SD430. This golden poppy is not the red variant that inspired Colonel John McCrae, a Canadian surgeon serving in World War I, to write In Flanders Field. McCrae was struck by the profusion of poppies that grew among the white crosses of the war dead. His poem inspired Anna E. Guerin of France and Moina Michael of Georgia to begin selling artificial poppies to help those who war had orphaned and left impoverished. Today, veterans at Veterans Affairs medical facilities and veterans homes help assemble the poppies, which are distributed by veterans service organizations throughout the country. Proceeds from the sale of these artificial poppies assist veterans and their widows, widowers and orphans. The poppy itself continues to serve as a perpetual tribute to those who have given their lives for their country.